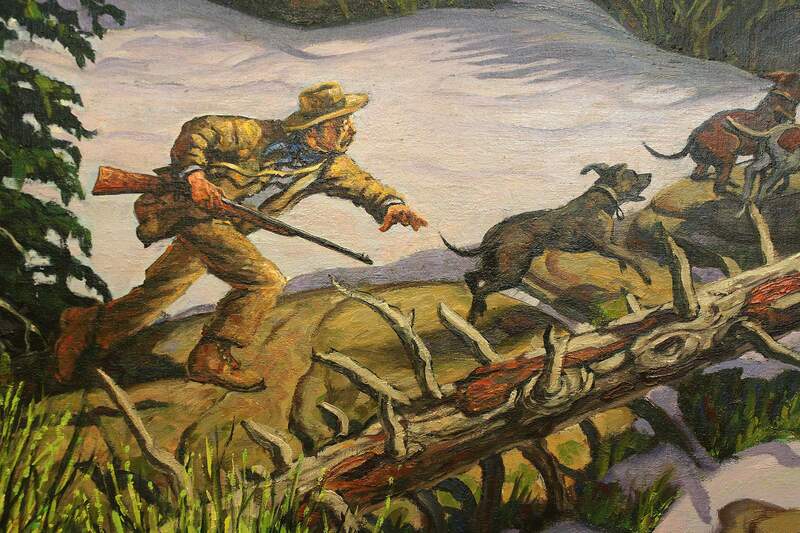 In this painting by Jack Roberts, President Theodore Roosevelt runs after a bear during his famous April 1905 bear hunt in Colorado. In actuality, Roosevelt probably would have stayed on his horse. 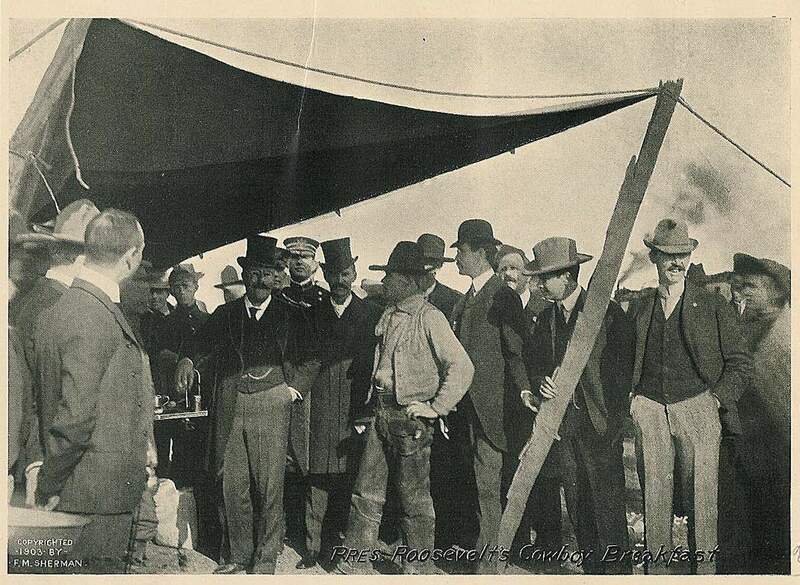 Cowboys flagged down President Theodore Roosevelt’s train as it crossed eastern Colorado near Hugo. They urged him to join them in a cowboy breakfast. 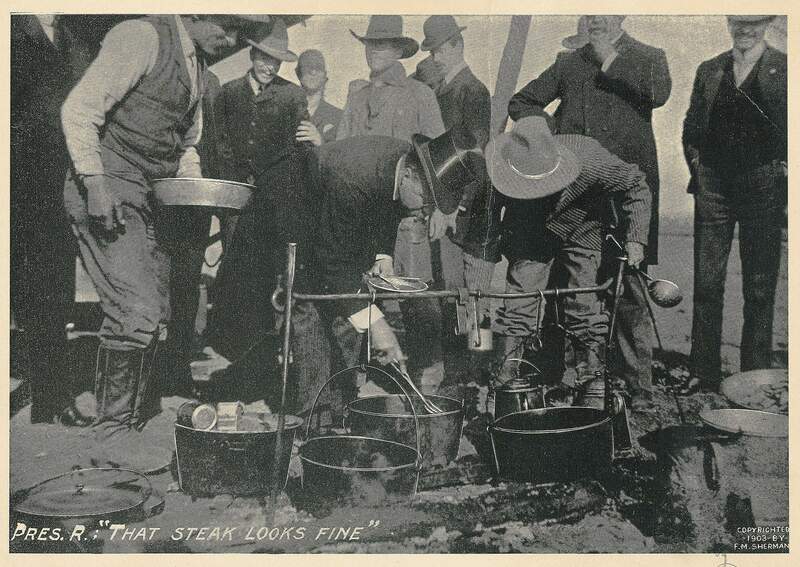 Never one to turn down a steak, Roosevelt ate with them before steaming off to give many speeches across the state. This is a detail of a standard Christian symbol found in many Protestant churches and in the Roosevelt Window. 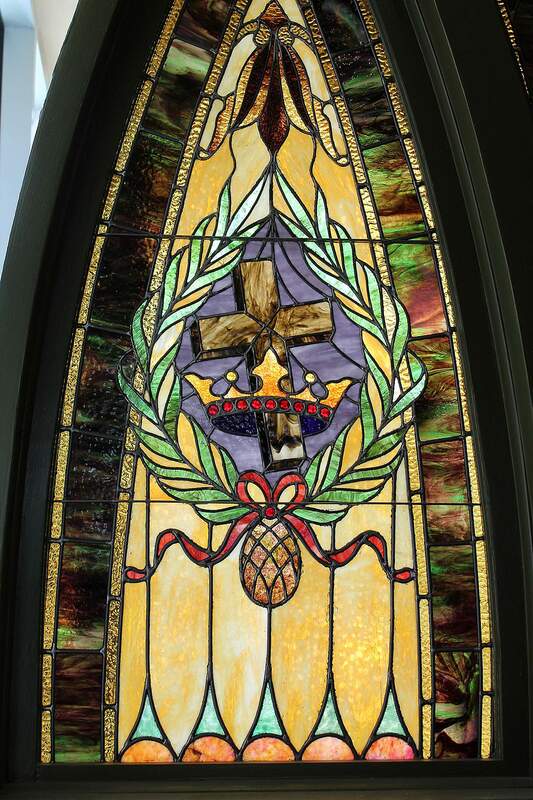 Though the Rifle Branch Library brochure for the window says it was made in Denver, another story is that the glass may have come from the Chicago firm of Flanagan & Biedenweg, which specialized in “Ecclesiastical Art in Memorial Windows.” The Rev. Horace Mann, who commissioned the window, offered a congratulatory “thank you” to the firm printed in its 1909 catalog. 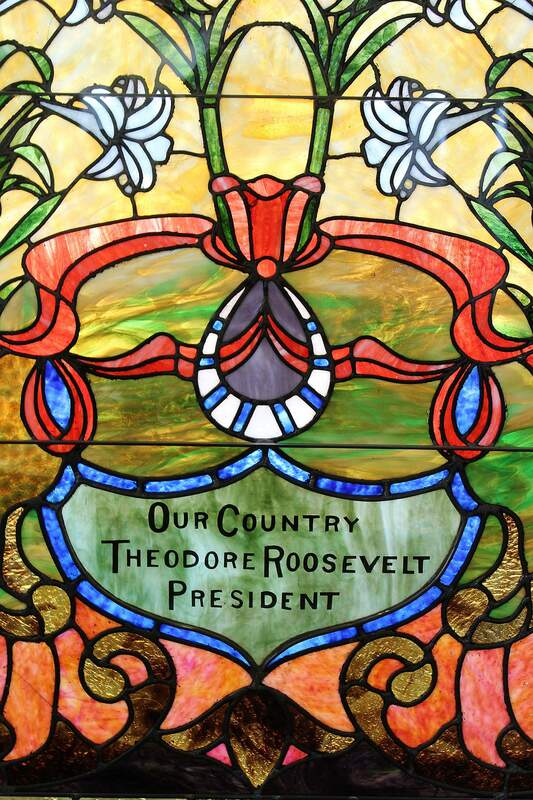 A detail of the Roosevelt stained glass window includes the phrase “Our Country, Theodore Roosevelt President.” Roosevelt was wildly popular in Colorado, and thousands of residents turned out to see him as his trains crossed the state north to south and east to west. Roosevelt was here both as a vice-presidential candidate and as president. The Rev. Horace Mann, who commissioned the Roosevelt Window, took an historic photo of President Theodore Roosevelt in hunting garb addressing a Sunday church service at the Blue School south of Rifle. The photograph is reproduced in this painting by Jack Roberts in the collections of the Museum of Western Colorado in Grand Junction. 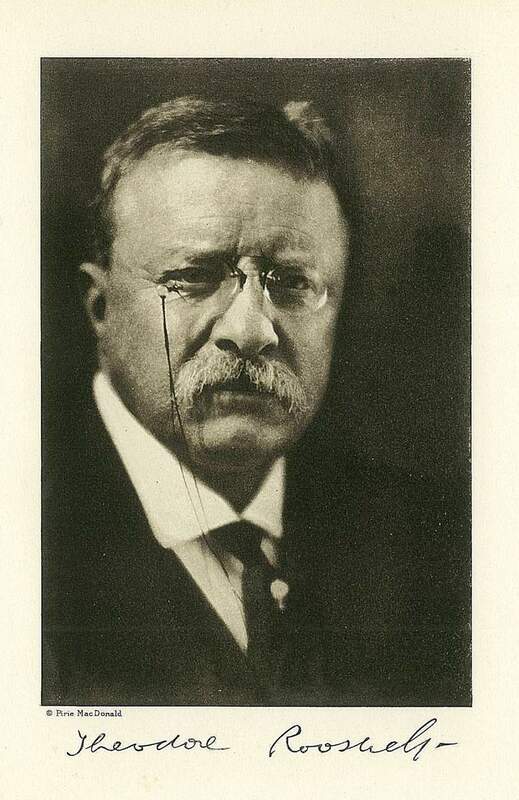 In this pensive portrait with pince-nez, Theodore Roosevelt looks forward into the future. He was the nation’s greatest conservation president, setting aside 230 million acres of public land between 1901 and 1909. A century ago, President Theodore Roosevelt died at his home in Sagamore Hill, New York, but his contributions to the West and to Colorado live on. Teddy was beloved by many Westerners, and he traveled throughout our state over a variety of years. 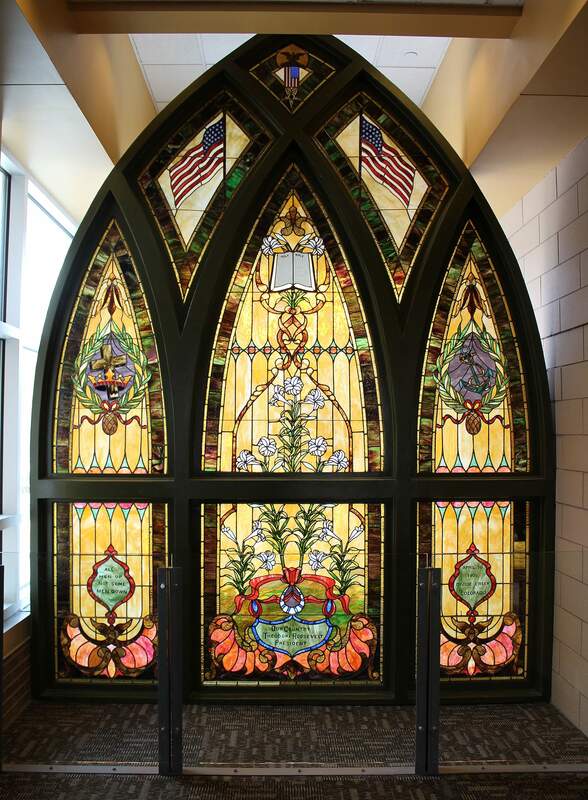 He hunted, gave speeches, held banquets and shook hands, but only one community memorialized his visits in a stunning stained glass window now visible in a public library. TR is my hero. I love his big, brassy smile, his shining white teeth, his penchant for shouting the words “BULLY!! !” and “DEELIGHTED!! !” A wealthy patrician who grew up in Manhattan with maids and tutors, Teddy suffered from asthma as a child, and his father wondered if the boy would ever grow to manhood. He did. 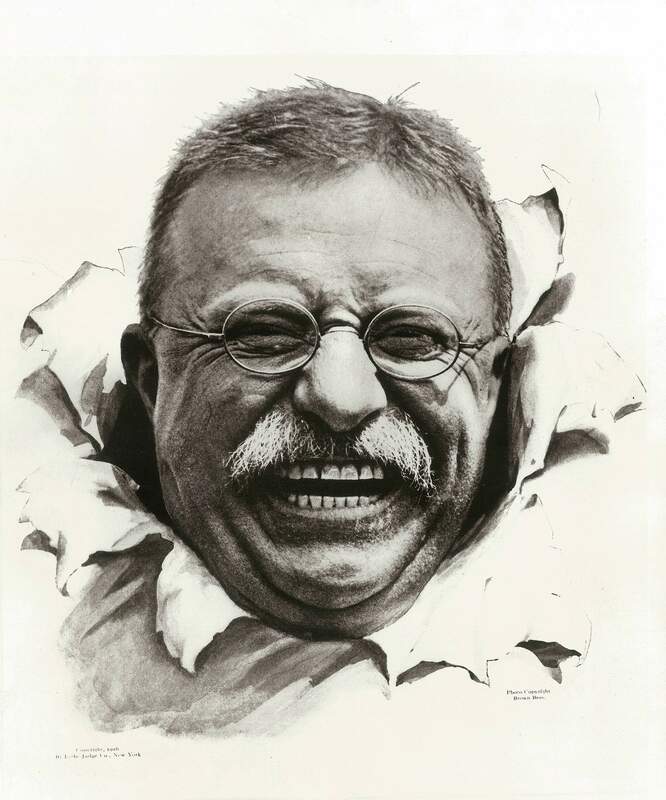 TR lifted weights, exercised in a home gym and became a midweight boxer at Harvard University. The course of his life flowed smoothly through college, politics and marriage, and then on the same fateful day, he lost his mother and his young wife. Devastated, TR traveled west to North Dakota to shake his grief, hunt bison and bears and become a cattle rancher. The West changed him forever. In September 1900, while campaigning for presidential candidate William McKinley, TR was governor of New York and the Republican vice presidential candidate. He toured Colorado. In Greeley, 3,000 people turned out to hear his high, squeaky, yet impassioned, voice. In Cripple Creek, the governor was flanked by former Rough Riders as 5,000 residents heard him speak. As vice president-elect, TR came to the Western Slope for a five-week cougar hunt. He arrived by rail, took the stagecoach north from Rifle, had supper at the St. James Episcopal Church Rectory and stayed at the Meeker Hotel. I think I’ve slept in the same room TR did. Maybe even in the same bed, or at least it felt that way. Teddy hunted from the Keystone Ranch in Coyote Basin and killed two of the largest mountain lions ever taken in North America. He processed the skulls that reside in the Smithsonian Institution’s National Museum of Natural History. 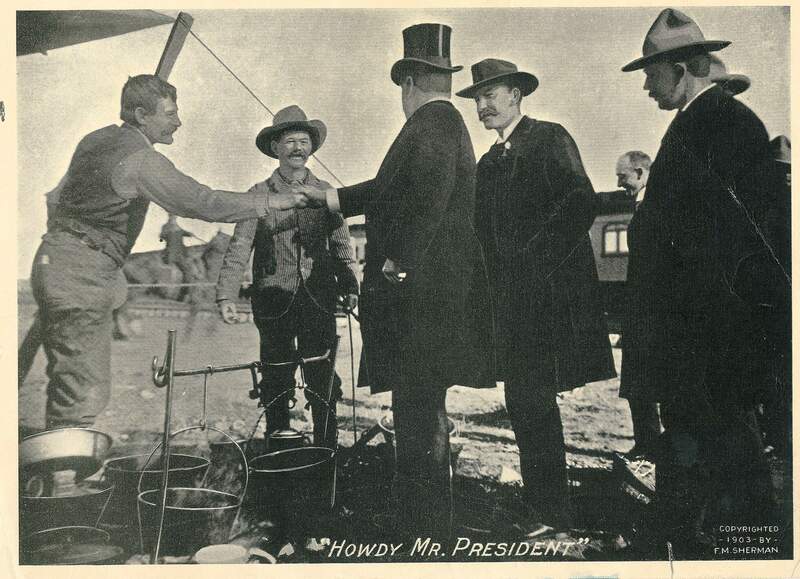 In 1901, an assassin shot McKinley, and at 42, “that damned cowboy” became the youngest president in American history. He brought his family to the “White House,” which he named, and plastered the walls with mounted big-game animal heads. His children slid down the staircase bannisters and once even took a pony up the mansion’s elevator. In May 1903, President Roosevelt took a famous cross-country railroad trip. As he entered the state out on the eastern plains, cowboys blocked his train. They invited him to a chuck wagon breakfast at Hugo. “DEELIGHTED,” Teddy jumped off his fancy palace railroad car and tucked into steak, eggs, biscuits, fried potatoes, brown gravy and black coffee. The same day, the president worked the crowds in Denver, Colorado Springs, Pueblo and Trinidad. HHHBored with the presidency and longing to be back in the saddle again, Roosevelt in April 1905 took his special train to Glenwood Springs and then rode west and south for a three-week bear hunt on Divide Creek. His hunting party included 20 horses, 30 dogs and a large cook tent. Local cowboys drifted in, often at dinner time, and TR exclaimed they were as hearty and fit “as young moose.” Teddy killed six bears that spring, and at least one of them may have been a grizzly. 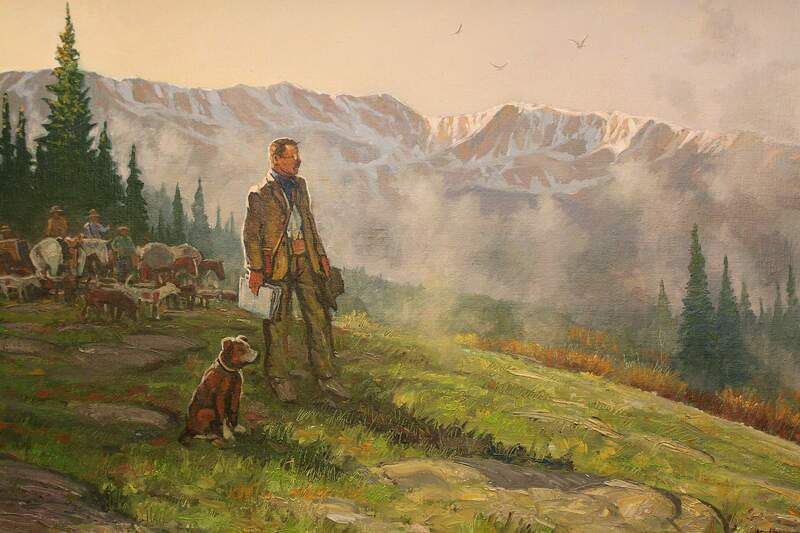 Jack Roberts painted President Theodore Roosevelt admiring Colorado’s mountain scenery during his famous spring bear hunt. Roosevelt said the West changed his life. Understanding the West and promoting conservation opened the door to the White House for him. From the pack of hunting hounds, he adopted a young pup named Skip, wrote letters to his boys about the dog, and eventually brought Skip to the White House. At the end of the hunt, TR hosted a huge party at the Hotel Colorado. A century later, in April 2005, I was honored to speak at the centennial event, which at $125 a person faithfully reproduced every item from the 1905 menu. As his hunting buddies got ready to eat, they were baffled by the china, the white linen tablecloths and the multiple knives, forks and spoons. Seeing their hesitancy, TR laughed and said, “Don’t worry, boys, just dig in with whatever utensil is handy.” They did. The president’s locomotive steamed all night. He left at dawn for further speeches in Salida, a photo shoot in the Royal Gorge where Skip can be seen standing up on two legs, Cañon City, then Denver. As president, TR believed deeply in conservation. Between 1901 and 1909, he set aside 230 million acres as national forests, national parks, national monuments and wildlife refuges. He saved for all of us 8,000 acres a day of public land during his dynamic time in office. When Congress realized Teddy was setting aside so much land as forest reserves, it moved to abolish the 1891 Forest Reserve Act. Undaunted, TR and his chief forester, Gifford Pinchot, removed all the furniture in a second-story bedroom in the White House, filled the floor with maps and crawled around on their hands and knees looking at boundary lines. Teddy declared another 12 million acres of national forests, many of them in Colorado, before midnight when he lost the authority to do so. HHHBut of all the Colorado communities TR visited, only one chose to commemorate Roosevelt’s time in our state. On Sunday, April 30, 1905, TR, dressed in his hunting garb, spoke at the Blue Schoolhouse south of Silt, and the Rev. Horace Mann photographed the event. 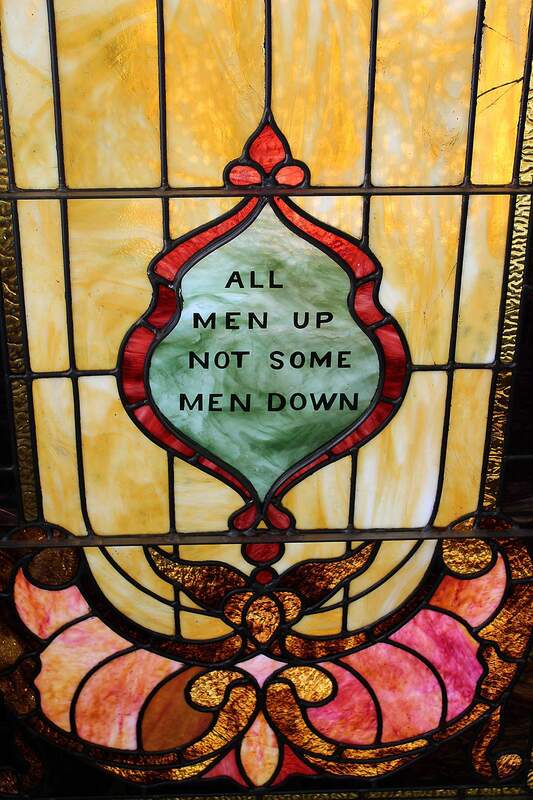 This phrase from the Roosevelt Window, “All men up not some men down,” drew enthusiastic applause when Theodore Roosevelt used it in a Colorado speech. Over the years, the Christian Church became the Presbyterian Church, and then it merged with the Methodist Church. By 1969, the building was sold. The windows were offered for sale in 1980. Under the leadership of Pastor Lynn Evans, concerned Rifle residents formed Heritage Windows Inc. to save the precious stained glass. Members of the group even signed personal promissory notes. Finally, the irreplaceable stained glass panels were restored and reinstalled in September 2010 at the Rifle Branch Library at 207 East Ave. For the 100th anniversary of Roosevelt’s death in January 2019, I spoke at the Rifle library about TR and the West. Just down the hall, the window panels shone brightly in afternoon winter light. The Roosevelt Window, originally designed for a Christian church, is now an important part of the Rifle Branch Library. President Theodore Roosevelt hunted bears south of Silt in April 1905, and this magnificent stained-glass window was commissioned by local minister Rev. Horace Mann. We’ll never hear his high, squeaky voice again. We’ll never see his clenched fist and his animated hand pounding a podium for conservation. But we can visit the Roosevelt Window in Rifle and contemplate the 43% of public land in Colorado and how much of a debt we owe TR for our national forests, our national parks and monuments and our open space. 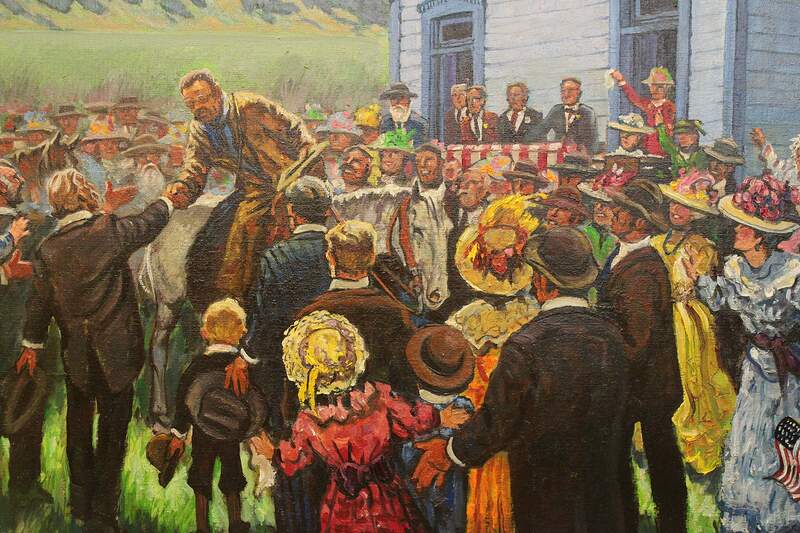 Fort Lewis College professor Andrew Gulliford speaks with KDNK Community Radio in Carbondale about President Theodore Roosevelt’s history in Western Colorado: https://bit.ly/2E8DAbh.